Is That a 64-bit App? Cyberknight asked the Windows forum how to identify 64-bit programs. Windows installs 32- and 64-bit programs in different locations on the hard drive. When you install a 64-bit program into a 64-bit version of Windows, the operating system stores the program files in a subfolder of C:\Program Files. But when you install a 32-bit program, Windows puts the program files in a subfolder of C:\Program Files (x86). Therefore, the easiest way to find out if you've installed a 64-bit program is to see where its files are stored. 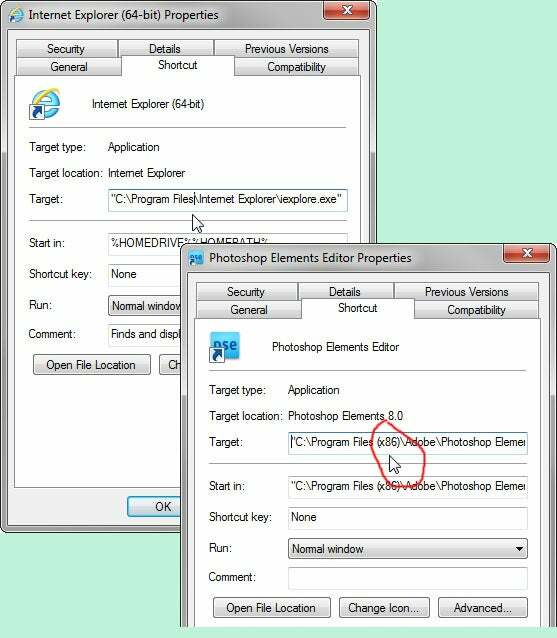 And the easiest way to do that is to right-click the program's shortcut in the Start menu and select Properties. The Target field displays the path to the program file. If there's no "(x86)" in that path, it's a 64-bit program. But why 86 and not 32? Historical reasons. The entire Windows/PC platform is based on chips that descended from Intel's first 16-bit processor, the 8086. The term x86, referring to that processor's instruction set, pre-dates the introduction of 64-bit personal computing. Remember that an x64 version of Windows can run both x64 and x86 programs, but an x86 add-on probably won't work on an x64 application. And an older, 16-bit program won't work on Windows x64 at all.